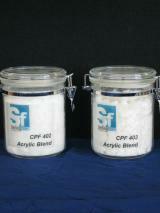 CPF 400 Series Fibers are special blends of acrylic pulp and reinforcing fibers. The fibers and pulp have been blended in such a way that the short cut staple fibers will not ball in dry mixed formulations when introduced into the Littleford or Lodige mixer. Blends with acrylic staple, melamine, and fiberglass are currently available. The process has also been demonstrated with carbon, basalt, and aramid short cut fibers. This technology could be extended to virtually any short cut staple reinforcing fiber where balling is a problem. Previous to the development of CPF 400 technology, compounders were limited to the use of very short fibers of about one millimeter or less, the use of aramid or acrylic pulps, or the use of controlled strand integrity fiber bundles. IMPORTANT NOTICE: The information and statements herein are believed to be reliable, but are not to be construed as a warranty or representation for which we assume legal responsibility. Users should undertake sufficient verification and testing to determine the suitability for their own particular purpose of any information referred to herein. NO WARRANTY OF FITNESS FOR A PARTICULAR PURPOSE IS MADE. Nothing herein is to be taken as permission, inducement or recommendation to practice any patented invention without a license.